WASHINGTON — Sen. Daniel K. Akaka (D-Hawaii) accompanied Brian Schatz on Dec. 27 as he was sworn in as Hawaii’s new U.S. senator, in keeping with the tradition of sitting senators ushering new senators from their home state. Sens. Brian Schatz and Daniel Akaka of Hawaii meet in Senate Majority Leader Harry Reid’s office. Akaka, who is retiring this week, walked with Schatz to the Senate president’s desk, where Schatz received the oath of office from Vice President Joe Biden. Immediately after the swearing-in, Akaka made remarks before the Senate thanking Schatz for “accepting this challenge,” declaring that Schatz will be “a strong progressive voice for Hawaii” and calling for unity among the Hawaii congressional delegation. Previously lieutenant governor, Schatz was appointed by Gov. Neil Abercrombie to replace Sen. Daniel Inouye, who passed away on Dec. 17. Inouye had asked that Abercrombie appoint Rep. Colleen Hanabusa, and Akaka supported her appointment as well. The Hawaii Democratic Party’s State Central Committee recommended three candidates to the governor, including Schatz and Hanabusa. “While there are other talented leaders in Hawaii who stepped forward and would also have been excellent appointees, I know that my colleagues will join me in supporting Sen. Brian Schatz, for the good of Hawaii,” Akaka said. Akaka will be succeeded by Rep. Mazie Hirono. Replacing Hirono in the House will be Congressmember-elect Tulsi Gabbard. Following Akaka’s remarks, Majority Leader Harry Reid also took a moment to praise him. “Your presentation right now is typical for Dan Akaka,” Reid said. “Never a word about you, always about somebody else. And if the new senator has the qualities of you, the kindest, gentlest person I have ever served in this body with, it’s something that he should strive. After the swearing-in, Akaka and Schatz met for over an hour in the majority leader’s Capitol office. Akaka answered questions and shared advice, and greeted Schatz’s family. I rise today to welcome Hawaii’s new United States senator, Brian Schatz. Brian is a leader, for Hawaii’s present and for our future, and I welcome him with much aloha, which is with warm love. I also welcome and congratulate Sen. Schatz’s wife Linda, their children Tyler and Mia, his brother, and Sen. Schatz’s proud parents, Dr. Irwin and Mrs. Barbara Schatz. 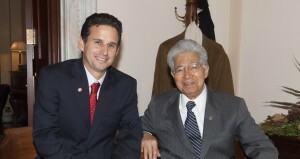 Sen. Schatz arrives in Washington during a sad time as we continue to mourn the loss of our champion Sen. Dan Inouye. Dan Inouye will always be a legend in Hawaii. He will never be replaced. At Dan Inouye’s memorial service in Honolulu this past weekend, I was reminded of how many people he touched in Hawaii and across the country. We must honor his legacy by working together for the people of Hawaii. I thank Brian for volunteering for this incredible responsibility. He only learned of his appointment yesterday and did not have any time to spare. So he hopped on Air Force One and flew straight to Washington to be sworn in here today. We need him here now because we are facing a major challenge, one that regrettably has been created by Congress and our inability to, thus far, compromise. The looming spending cuts and tax increases known as the fiscal cliff must be fixed within the next five days. Mahalo, thank you, Brian, for accepting this challenge. I am here to help you in any way I can. While there are other talented leaders in Hawaii who stepped forward and who would also have been excellent appointees, I know that my colleagues will join me in supporting Sen. Brian Schatz, for the good of Hawaii. Throughout my 36-year career in Congress, the Hawaii delegation has always been unified. We have always put Hawaii first, before our individual ambition. We must continue that. Hawaii comes first. I have followed Brian Schatz’s career for many years. He was an active member of the Hawaii State House of Representatives for eight years before becoming CEO of Helping Hands Hawaii, a non-profit organization that provides human services in the islands. As lieutenant governor, he has been a big part of our community. He has been an outspoken supporter of our troops and veterans, and defender of our environment. Sen. Schatz will be a strong progressive voice for Hawaii in the United States Senate. He will advance freedom and equality. He will be a strong voice on climate change, expanding clean renewable energy and protecting our precious natural resources. He will defend Native Hawaiians and all of our nation’s first people, those Americans who exercised sovereignty on lands that later became part of the United States. He will uphold the values and priorities of our unique state. I say to my friend, the new junior senator from Hawaii, never forget that you are here with a solemn responsibility, to do everything you can to represent the people of Hawaii, to make sure their needs are addressed in every policy discussion, and to speak up and seek justice for those who cannot help themselves. God bless you, Sen. Schatz. God bless Hawaii. God bless the United States of America.